Here's the new Blackberry Playbook tablet I mentioned in class, with the new OS QNX. We just played with a wonderful tablet, and it wasn't running Android, webOS, iOS, or even Windows. It was running a funky realtime operating system called QNX that RIM bought in April, combined with WebKit and a heaping helping of Flash, and plans on releasing to the world in Q1 of this year. The BlackBerry PlayBook is surprisingly polished and responsive at this stage, even though RIM says it has a lot of work to still left to do. In fact, the only thing frustrating about our roughly 30 minutes with the tablet (under the caring gaze of Mike Lazaridis) was the fact that you can't buy an actual BlackBerry phone right now that's anywhere near this enjoyable to use. Follow after the break as we talk through the product, along with a video walkthrough and stress test of that dual-core proc's multitasking chops. 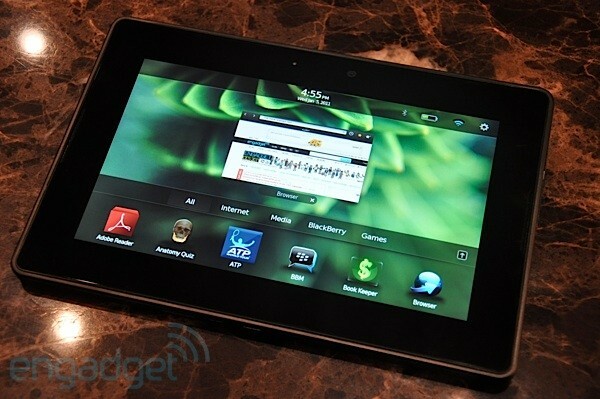 BlackBerry PlayBook preview originally appeared on Engadget on Thu, 06 Jan 2011 00:56:00 EDT. Please see our terms for use of feeds.